Connie Weigel spent six years searching for a compostable, stemless wine glass. The director of purchasing for the catering company that serves the Minneapolis Convention Center finally found the perfect product in August. That's when Weigel saw a video featuring a champagne flute made by SelfEco, a Stillwater-based company that makes high-end industrial compostable dinnerware and flatware. "It was, like, oh my gosh, where have you been?" said Weigel, who works for Kelber Catering. "I'd been looking for a compostable wine glass since 2009 — that's when we went green over here in the convention center." Weigel called Danny Mishek, the company's president, at 8 a.m. Within three hours, he and SelfEco's product designer Chad Shaffer were in her office with samples in hand. SelfEco is a sister company of VistaTek, a family-owned custom-injection molding company. 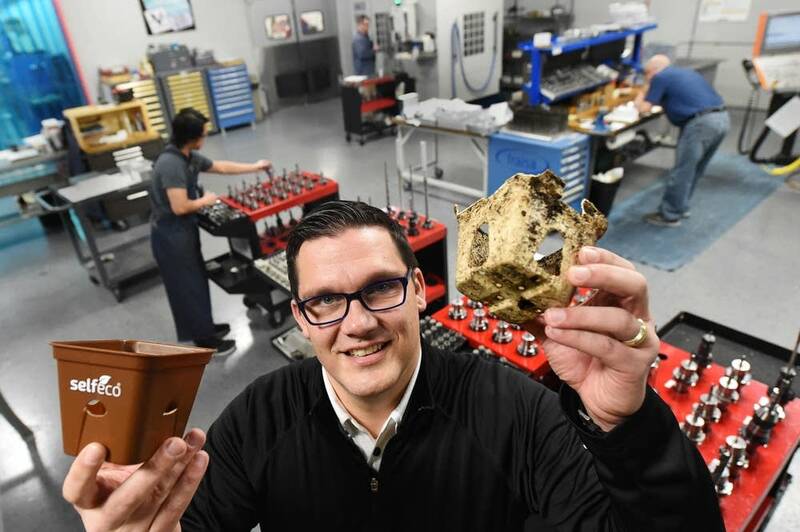 The company, which has about 40 employees, began making its own products from plant-based materials last year. Their line, which features nine colors, includes champagne flutes, martini glasses, Asian spoons and tiramisu cups. "Can you believe there is nobody in the world right now — that we're aware of — who is making a champagne flute out of plant-based materials?" said Mishek, who also serves as VistaTek's manager director. "Everybody said we need to make bowls and cups and plates, but not everything goes in a cup or bowl or plate." The convention hall's mission includes a commitment to minimal waste. Along with efforts to cut water usage and boost recycling, the center uses environmentally friendly concession products. Weigel said convention center staff used to be embarrassed to serve "an $8 glass of wine in an ugly, ugly old-fashioned 9-ounce plastic-looking cup that just happens to be compostable." 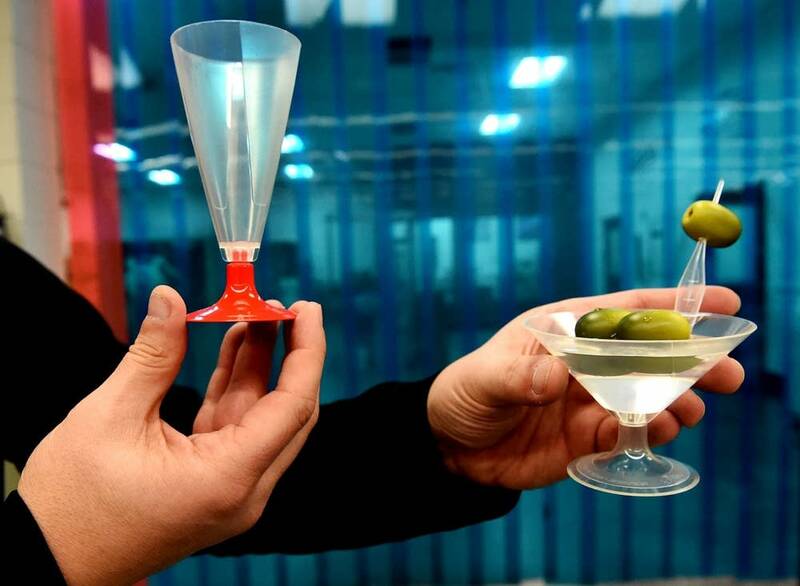 The new stemware is appealing and "exactly what we've been looking for," she said. "This has been the missing piece since we started going green." The convention center's most recent order includes 30,000 compostable, stemless wine glasses for visitors to the Minneapolis Boat Show later this month, Weigel said. "It feels good in the hand. Our bar staff is excited. The amazing thing is, they feel like they're not disposable. They feel like a hard plastic." Mishek, former president of the Upper Midwest chapter of the Society of Plastics Engineering, came up with the idea for SelfEco after attending an Innovation Takes Root convention in Orlando, Florida, in 2014. The 300 attendees included academics, chemists and material compounders, he said. "They were all trying to sell to one another, but no one had a product — just the raw material," he told the St. Paul Pioneer Press. "I'm the only manufacturer there at this entire conference. I said, 'Either I'm at the right place, or I'm in the wrong place.' I came back and said, 'We need to develop our own product around these materials.'" The company's products are made from a plant-based byproduct called polyactic acid. Using PLA reduces dependence on fossil fuels and minimizes greenhouse gas emissions, Mishek said. SelfEco shares VistaTek's 56,000-foot facility; it produces most of its products on VistaTek's 165- to 220-ton injection presses. SelfEco officials spent three months doing product development, branding, pre-production and filing for patents. It took seven months to get compostable certification from the Biodegradable Products Institute, Mishek said. VistaTek was founded in 1996 in Vadnais Heights by Mishek's parents, Jim and Lori Mishek. Mishek's brother, Allen, serves as the company's account manager; sister Jennifer Sutherland served as the company's director of finance from 2002 to 2015. The family moved the company in 2013 to part of the former UFE Inc. manufacturing site on Greeley Street. Mishek said the family has a long history in manufacturing. His paternal grandfather, George Mishek, worked at Dayton Bluff Sheet Metal and Lawrence Sign in St. Paul; his maternal grandfather, Ken Wilson, was the founder of Wilson Tool International in White Bear Lake. "We were destined to make things," Mishek said. On Jan. 11, SelfEco was set to launch a new home and garden line of products. The company hopes to raise $25,000 through the Kickstarter.com fundraising site. In a makeshift greenhouse in the company's mezzanine level, green pepper and broccoli seedlings are sprouting under a grow light — two of the seedlings are in traditional garden pots; two are in SelfEco pots. The plants grown in SelfEco's four-inch square pots are noticeably bigger and sturdier. The pots are designed with tabs on the side that can be peeled off. The gardener can then put the pot directly into the ground, Mishek said. "We call it direct-source feeding. You're feeding the roots instead of feeding the topsoil of the plant." Mishek said the company decided to launch the Kickstarter campaign to draw awareness to the product. "It's just a different way of thinking, and we feel we almost have to pull this forward," he said. Mishek thinks SelfEco's products could radically change the market. "I've had people tell me that my products are disruptive technology — meaning it's going to change how people do it in the future," Mishek said. "Look at iTunes. Nobody thought that people were going to want to buy a song for a dollar back in the day, and now that's the only way people download music. "When you introduce the concept, it's threatening," he said. "It's different. People don't really like change or embrace change. In product development or manufacturing, I feel that there is no other alternative than to create the change. That way you can try and control it ... because it's going to happen."